UPDATE: the URGENT ACTION to keep 2 homes and a soccer Field standing succeeded! Last week, the villagers of Um Al Kheir received demolition orders and, together with their lawyer, scrambled to petition the High Court of Israel to stop imminent demolition. It worked. But what happens next time? In February, 2015, Society of St. Yves raised the alarm: the Israeli Civil Administration issued dangerous new rules making it even harder to save Palestinian homes and villages from demolition. 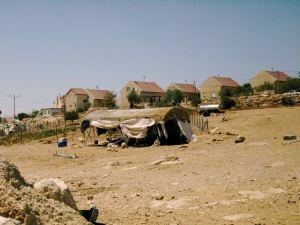 Umm al-Khair is one of many Bedouin villages in the south of the West Bank that is at risk of home demolitions and forced relocation due to settlement expansion in Area C - in this case, the Israeli settlement called Karmel. Umm al-Khair was recently visited by a member of the US concilate amidst growing concerns for the well-being and human rights of its residents, but this faint diplomatic interest is not enough. We are inviting you to listen to the conference call recorded on Jan 16th, 2015 to learn from our speakers about the current status of Umm al-Khair and the lives of its residents. We will also have a follow-up call that includes congressional staffers. The past few years were exceptionally hard for 125 registered refugees living in the community, who live on land to which they hold titles. Starting October 31st, 2008, Israeli forces demolished a number of residential buildings in the community due to proximity to the settlement. Despite the efforts of lawyers, activists, international NGO’s and residents to stop it, the settlement continues to expand and take over the legally owned land that Bedouin farmers use to graze their sheep, which makes up nearly 70% of the economy of the village. Against the odds, residents are planting a thyme farm to earn enough money to pay for a kindergarten and assert their right to remain in land that they have legal title to. In addition to many homes being demolished, bulldozers now target the traditional taboun oven, which bakes the much needed bread for village residents. Demolitions continued in 2010, 2011, and 2013, and most recently three demolitions on October 27th and 28, 2014. Sadly, these demolitions were followed by the confiscation of tents donated by the International Committee of the Red Cross and Ministry of Local Governments on November 1, 2014, despite their being the only shelters left for displaced residents. Help bring an end to the madness. Help bring a voice to the people of Umm Al Khair.